* Our fresh pasta is made in-house with Sunrise Flour Ancient/Heritage Grains which does not adversely affect those who have gluten sensitivities. * A note about our fresh pasta made with Ancient/Heritage Grains. Proprietors, Darrold and Marty Glenville, have dedicated themselves to the mission of bringing back Heritage Wheat that our ancestors ate. The modern developments in grain have made it difficult for some people to digest, but that doesn’t necessarily mean they need to change to a gluten-free diet. These superior stone-ground flours aren’t just for those who experience problems with gluten. Many people use Heritage Wheat because it truly tastes like wheat and results in delicious pastries, breads, pasta and pizza. We are ecstatic about introducing our customers to this superior product which not only is tasty but healthy. 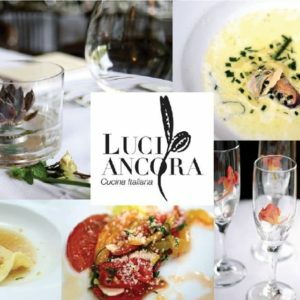 Luci Ancora is open Tuesday-Friday 11:30-2pm for Lunch. or Create Your Own Three Course Tasting Menu with our Colazione for $20. Certain dishes on our menu may be altered to satisfy dietary needs. Please inquire with the staff. DUE TO BEST-IN-SEASON SOURCING FROM OUR PARTNERS (SANDRA JEAN’ HERBAL FARM OF SOUTH HAVEN, GENTLEMAN FORAGER, PETERSON PURVEYORS, SUNRISE FLOUR MILL, HONOLULU FISH, AND FORTUNE FISH & GOURMET) OUR MENU IS SUBJECT TO CHANGE. A note about our fresh pasta made with Sunrise Flour Mill Turkey Red Grain Flour. Proprietors, Darrold and Marty Glenville, have dedicated themselves to the mission of bringing back Heritage Wheat that our ancestors ate. The modern developments in grain have made it difficult for some people to digest, but that doesn’t necessarily mean they need to change to a gluten-free diet. These superior stone-ground flours aren’t just for those who experience problems with gluten. Many people use Heritage Wheat because it truly tastes like wheat and results in delicious pastries, breads, pasta and pizza. We are ecstatic about introducing our customers to this superior product which not only is tasty but healthy.